Perhaps the greatest and most celebrated Italian operatic tenor of the early 20th century, Enrico Caruso appeared in a number of roles from the Italian and French repertoires. According to music historians, Caruso was one of the earliest musicians to register his voice on gramophone record. Born in Naples, Italy in 1873, his father was a mechanic and foundry worker. After briefly working as mechanical apprentice, Caruso started taking voice lesson from Guglielmo Vergine at the age of 16. His musical ambitions were encouraged by his mother, who urged him to sing in a church choir. Although he never received any formal education, Enrico Caruso possessed brilliant musical instincts and remarkable emotional range. In his earlier career, he acquired professional coaching and worked diligently on correcting his imperfections. Within a few years, Caruso was able to build his legendary technique and freedom that crystallized the unique quality of his big voice. Renowned Salerno conductor Vincenzo Lombardi gave him his first musical training which became the basis of his mature vocal technique. The dark yet pleasant quality of his middle voice, coupled with the ringing grandeur of the sustained top notes, earned him an impeccable reputation. Caruso’s virtuoso command of phrasing owed largely to his amazing breath control and large physical build. His broad throat and the spacious resonance areas of his head were connected with a massive chest cavity that Caruso was famously able to expand a full nine inches upon inhaling. His contemporaries and fans adored his majestic yet serene sound and his warm, high-spirited personality. Commercial sound recording industry was still in its initial stages of development when Caruso started recording. His concert fees reached as high as $7000 per performance and he received highly lucrative record royalties. Caruso died aged 48 of pneumonia and peritonitis in 1921. Buried in the Cemetery of Poggioreale, Naples, he left an estate valued at millions of dollars. 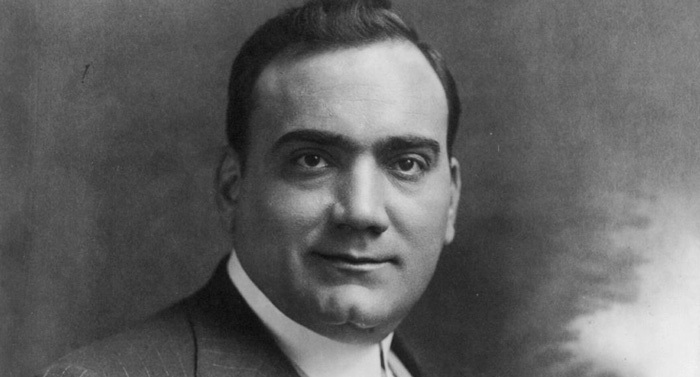 Enrico Caruso earned numerous awards and accolades in his career. He was elected an honorary member of the music society, Phi Mu Alpha Sinfonia, in 1917. Caruso was posthumously granted a Grammy Lifetime Achievement Award in 1987. Enrico Caruso married Dorothy Park Benjamin in 1918. The couple had a daughter, Gloria, in 1919. Caruso also had two sons by his relationship with soprano, Ada Giachetti.